Back in winter 2013, I visited Bamburgh in Northumberland with a friend. We had both been to the area quite a few times and we had high hopes for our trip. As we made our way down to the beach for what we were sure would be an amazing sunrise, our expectations were sky high. As it turned out, there was some faint colour in the otherwise stormy sky and we found ourselves battered by the wind and rain. The following day was equally disappointing but for different reasons. We went down to the beach again and readied ourselves for the sunrise. It was already raining hard and the wind was making it very difficult to shoot, even with a sturdy tripod. We sat in the car wondering what to do, waiting for the last moment when, if the sun broke through we would run down and catch the scene. What happened next was amazing. The sun did break through and lasted only a few minutes, but the sunrise was like nothing I have never seen before. It was as if a weeks’ worth of amazing sunrises were compressed into a few minutes. If I described the scene as nuclear it would not be an understatement. But I’m not going to show the shots from that sunrise. They simply look unreal. The best word I can use to describe the images now is vulgar. Even the unprocessed RAW files look fake. What I am sharing though is one of the many “failed” images from the first morning. I happened across this image looking for examples to use in my Nik Silver Efex book (I decided the original needs an update). when it failed to meet expectations. It’s only now when I come to work on the image, having separated myself from the shooting, that I can really see the beauty of the morning. It’s always worth checking your old archives. 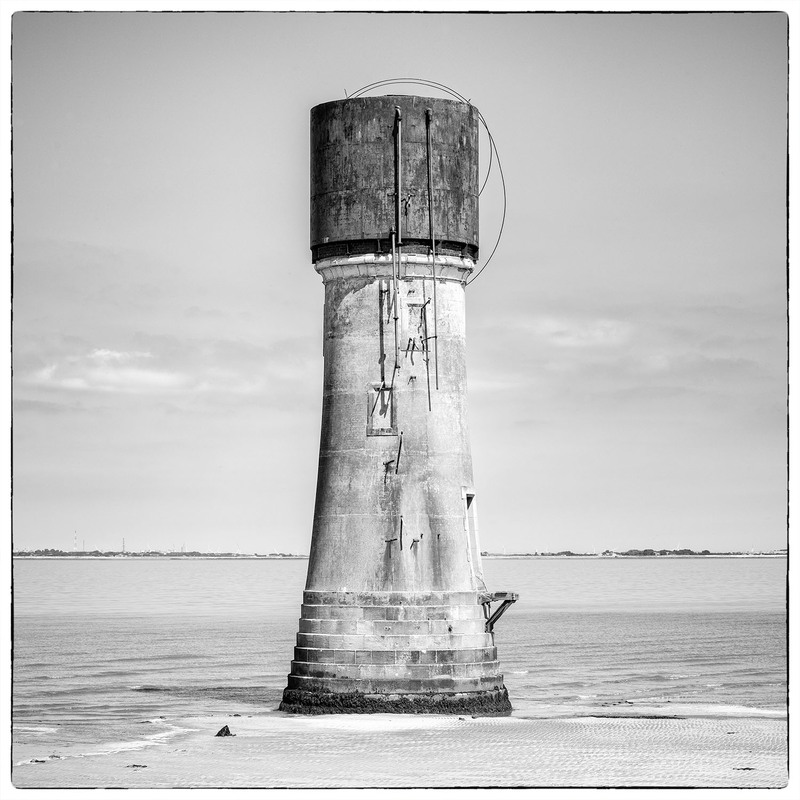 Water Tower at Spurn Point. Nikon D800, 24-120mm Nikon f/4 lens, ISO100, 1/160″ at f/13. Conversion to B&W in Nik Silver Efex Pro. If you’re a regular follower of this blog, you will have noticed there wasn’t a Friday Image last week. This is because I was in Amsterdam for a short break with my wife where we also met up with our daughter, her husband and our grandson. We returned on Saturday and I headed over to Spurn Point with a friend on Sunday. As a lot of readers won’t be familiar with the area I should explain. On the North East coast of the UK we have the large city and port of Hull. If you travel through Hull and out to the end of the Humber Estuary you will come to Spurn Point, which is a tidal sand island. There isn’t much there except a lighthouse, Lifeboat Station and this old water tower. Our intention had been to shoot some of the sea defences there. The weather had forecast cloudy and we thought it sounded promising. Unfortunately, the forecast was wrong. The sky was clear blue with the exception of a few wispy clouds on the horizon. The sea defences will be worth shooting in the future but not in the conditions we had. When I spotted this water tower I could immediately see the potential for converting it to mono. What surprised me thought was that the colour version is quite nice. Colour image prior to conversion with Nik Silver Efex Pro. I also need to admit to something as a few of you will spot this and ask questions. I have bought another Nikon D800. The camera was an absolute bargain; it looks like new and has only a few thousand on the shutter count. The last time I bought a D800 I hated it and sold it 4 months later. This time, I’m really enjoying it. The difference seems to be the lenses I bought. One of the lenses is a 24-120mm f/4.0 which this image was captured with. With this on the camera, I’m finding it a pleasure to use. It also has VR which allows me to shoot at surprisingly slow shutter speeds. This is never going to be my main camera (I like the Fuji X-T2 too much) but it’s very impressive and the results are excellent. At the weekend, I did something I haven’t done before. I headed up into the hills behind Dovestones reservoir for photography. Now I need to qualify that statement as I have taken plenty of photographs in the area. The difference this time is that I was heading out for the purpose of photography and nothing else. Usually when I take photos here, I’m out walking and happen to have a camera with me. The problem when you’re out walking is that you have a different primary purpose. You may pause for a few seconds or even minutes to grab a shot, but it can’t compare to dedicated photography. The most noticeable difference for me this weekend was that I would leave the path regularly to find the right viewpoint as well as the best angles and composition. This probably seems obvious but I hadn’t previously realised how wedded to the path I was when walking. The image above, which is one from the weekend is a good example. To reach this you need to leave the path and scramble over some rocks. You would never achieve this view or vantage point by keeping to the path, even though it’s only around 100m from the path. What it’s made me realise is that whilst I have always maintained that this is a difficult area to photograph, the problem was my approach. I’m now wondering how many other good locations I have missed because I had the wrong primary purpose. I should also say a big thanks to Dave who was the reason I ventured up to this location in the first place. He had wanted to photograph the Trinnacle rock for a long time (that image is still to come). Although I was never keen to photograph in the area (because I thought it was difficult and I live here) I said I would take him as it can be tricky to find. If it hadn’t been for this I would possibly never have opened my mind to the possibility. I now can’t wait to get back up there. The Trinnacle, Saddleworth. Sony RX10, ISO80, f/6.3, 1/125″. 0.6 ND Graduated filter. B&W conversion in Nik Silver Efex Pro. If you’re a regular reader of this blog you may have noticed I didn’t publish the usual Friday Image last week. Instead, I was at a used car dealership picking up a new car. I decided after more than 6 years of excellent service, it was time to change my trusty Honda Civic for a newer car. The Honda was now 9 years old and had 108,000 on the clock (90,000 of which is my mileage). The replacement car is a 3 year old Volvo, which I hope to run for a similar period and also hope is just as reliable. You see, I like to buy good quality used cars with low mileage, then run these until they start to wear out. This way, the bulk of the depreciation has already been suffered by someone else. Taking the Honda as an example, the engine was running amazingly well and had plenty of miles left. But there were a few niggling problems starting to surface. The windscreen washer motor had sprung a leak and had to be replaced. Then the air conditioning had packed up a few weeks back. Then most worrying there was an odd mechanical clunk from the engine when setting off or slowing down which could be felt through the peddles. Time to change. Whilst thinking about buying a low mileage quality used cars, I realised that my camera buying habits were quite different. Most of my cameras tend to be purchased new and I am the one suffering the depreciation. What I should be doing is looking for good examples of excellent used equipment that’s been well maintained. I could probably have saved myself a small fortune by now. Changing the subject almost entirely, the image you see at the top of the screen is the one that I would have published if I had been able to shoot it in time. It’s a rock formation called The Trinnacle, found at Dovestone near to where I live. It’s one that I have tried to find a number of times in the past but often the path has been blocked by various natural and man made features. This time I was able to reach it and captured the image using my Sony RX10. Since I had the RX10 repaired (the lens unit was replaced as it had a fungus problem – so much for being sealed) it’s performed brilliantly. The image quality definitely exceeds the previous lens and this continues to be my go to camera for walking. I wonder at what stage I will decide it needs to be traded in for a newer model. Porth Kidney Beach. Olympus EM5 + 12-40mm lens. You might have noticed that there was no Friday Image or posts this week. If you were wondering why, it’s because I took a much needed holiday. But despite the holiday I still took a couple of cameras along with me to capture the landscape. Here is one from the beach near to where I was staying. If you’re wondering where this exotic tropical scene is, it’s Porth Kidney Beach in Cornwall, near to St Ives. The sea there is so blue and clear. It’s a wonderful place to take a holiday and get away from everything. But now I’m back and starting to work through all the emails. Ogden near to Newhey (North West England). Sony RX10 with 0.6 ND grad filter. I’m pretty sure most of the regular readers of this blog can see that my passion is the beauty of the natural landscape. What many probably don’t realise is that I have a fascination for manmade objects that have become part of the landscape. Don’t ask me to explain why or how this developed, I just know that some objects in the landscape catch my attention. The image above is one example. Every time I pass this group of Pylons I spend time trying to capture them with pleasing compositions. I used to think of these as being ugly and a blot on the otherwise perfect landscape. Now I see them and find the interesting. I’m not yet sure I can call these pylons beautiful but they are a challenge to photograph and create interesting shapes. The wind turbines that now litter our moorland and coastline are similar. I used to think they are ugly but now find them almost majestic. I even included a full-length editing example in one of my books for a wind turbine image. Does anyone else find these things interesting or is it just me? Infrared tree study using an Olympus EM5 converted to shoot infrared. The weather on this day was painfully difficult. I considered almost all my images to be failures with the exception of a few shots taken of this tree. Yesterday I published an article on my Lenscraft website titled “How to become a Successful Photographer”. If you have 5 minutes to spare I would encourage you to head over to Lenscraft to read it. In writing the article, something occurred to me which is obvious and yet we often lose sight of. What do we consider being a successful photographer to be? For some it may be the ability to earn a living from their photography. For some it may be winning competitions or being accepted by a Gallery. My own definition of being a successful photographer is being able to consistently produce images that are high quality and which engage with my audience. All the other “measures” mentioned above are for me secondary outcomes. What really matters is the quality of my work and how I as the photographer feel about my work. What I would really be interested to know is what defines success for you? If you have any thoughts, please add them as comments to this post.